Colin Kaepernick has been a shell of his former self so far this season, and 49ers head coach Jim Tomsula believes it's linked to confidence. 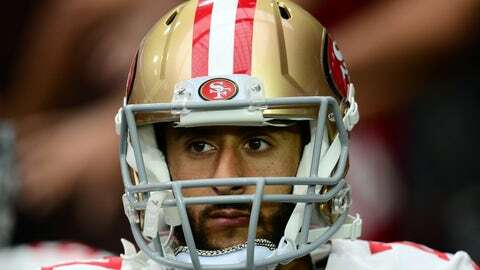 San Francisco 49ers quarterback Colin Kaepernick has struggled mightily, but head coach Jim Tomsula isn’t about to insert backup gunslinger Blaine Gabbert. Through four games, Kaepernick has averaged 181.8 passing yards and 48.8 rushing yards per outing. However, he’s thrown just two touchdowns compared to five interceptions as well as rifling more than a handful of passes into the dirt in front of his intended target. And, to make matters worse, the Nevada product’s best performance didn’t even matter. Kaepernick racked up 386 total yards and two touchdowns against the Pittsburgh Steelers, but the 49ers lost 43-18. Tomsula wants Kaepernick to play confidently, but he’ll need to display poise — which he hasn’t done all year — on Sunday Night Football when San Francisco battles the New York Giants at MetLife Stadium.